Obituary – Bridal, John Howard « Perry High School Alumni Association, Inc.
Football 45-48, Wrestling 47-48, Homeroom President 45-48. John Howard Bridal, son of John H. and Mary Katrina (Schwartz) Bridal, was born on October 11, 1930, in Enid, Oklahoma. He passed from this life on August 7, 2017 at his home in Perry, Oklahoma at the age of 86. John moved to Perry when he was 11 years old. As he enrolled in summer band, he met his future bride to be. He was a 1948 graduate of Perry High School where he was a 155 # end and tackle for football Coach Hump Daniels. He served as a homeroom President and was on the Teen Town Council. 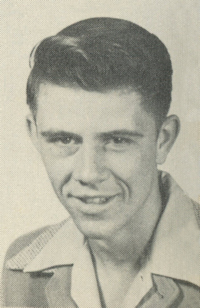 After graduating from P.H.S., he was employed by Shell Oil Company and was transferred from Lucien, Oklahoma to the plant in Elk City, Oklahoma. After 5 1/2 years he purchased the Borden Milk Distributorship and moved back to Perry. He was later employed by The Charles Machine Works, (Ditch Witch) as a District Representative and Special Accounts Manager. His place of employment before retiring was at the First Bank and Trust as their P.R. person. He earned the promotion of loan officer and Vice-President. John’s community activities included: P.T.A. President, Campfire President and was an Honorary F.F.A. member. 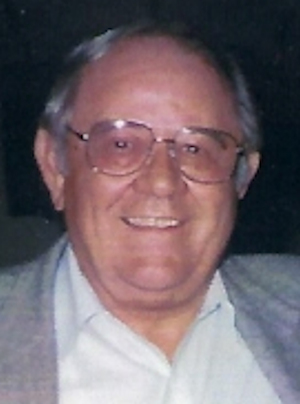 He was Past President and Zone Chairman of Lions Club, Co-President of Shooting Star Square Dance Club, served on the board of Chamber of Commerce, United Fund Director, executive committee of the Republican Party, and on the Noble County Excise Board. Held membership in the Stagecoach Community Theater, Y.M.C.A,. Perry Main Street, Perry Alumni Association, and Perry Elks Lodge. He was a baptized member of the First Christian Church where he served as a deacon, C.M.F. President, greeter and was on the finance committee. He later became a member of FUMC. John and Doris Manning were married on June 16, 1950, and began a 67 year adventure together. They have a daughter, Cathie Ann Kincaid, and a grandson, Jon Travis Wilhelm. John’s greatest enjoyment was watching them grow from babies to responsible citizens. His hobbies have been raising cattle, travel, the Stock Market, watching O.U. football and basketball. He enjoyed having coffee at The Kumback with friends where he mercilessly harassed everyone he liked. He was a man of unimpeachable honesty and integrity. His family knew him as a workaholic! He is survived by his wife, Doris, daughter, Cathie, and grandson, Travis. Preceding him in death were his father, mother, and half brother, Boyd. Services will be held 10am August 12, 2017, at the First United Methodist Church of Perry, Oklahoma with burial following at Grace Hill Cemetery Pavilion under the care of Palmer Marler Funeral Home of Perry. Pallbearers are Verl Brorson, Gary Bridwell, Charlie Hanger, Johnny Fuller, Brad Finley and Kirby Riem. Donations may be made to the First United Methodist Church, Perry Alumni Association, or to Hospice via Palmer Marler Funeral Home.